There are many versions of this formula, which is often referenced in herbals dating from medieval times to the present. The French doctor Jean Valent including this one in his groundbreaking book on aromatherapy. The story goes that this formula was revealed in the 17th century by four corpse-robbers caught red-handed during the time of the great plagues of Toulouse (1628-1631). Their disregard for the contagion thoroughly astonished the judges... The archives of the Parliament of Toulouse record that: "During the great plague, four robbers were convicted of going to the houses of plague-victims, strangling them in their beds and then looting their dwellings: for this they were condemned to be burned at the stake, and in order to have the sentence mitigated they revealed their secret preservative; after which they were hanged." Steep the plants in the vinegar for 10 days. Force through a sieve. Add the camphor dissolved in the acetic acid then filter. 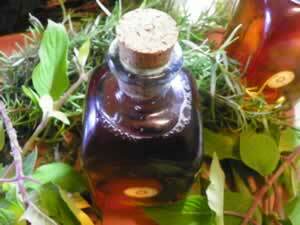 This vinegar finds its use in the prevention of contagious diseases. Rub it on face and hands and burn it in the room. It can also be kept in small bottles for the vapours to be sniffed in cases of fainting.